Restoring canine gut flora balance. Ygia combines the broad digestive benefits of probiotics with the natural, highly targeted ability of proteobiotics. The result is a healthy digestive tract for dogs, contributing to their overall well-being. This three-step illustration shows how the proteobiotics in Ygia help restore balance in canine gut flora. In an unhealthy gut, harmful pathogens initiate an infection using ‘quorum sensing,’ a form of cell-to-cell communication. 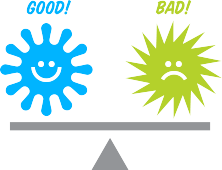 Probiotics produce proteobiotics which interfere with cell-to-cell communications between harmful bacteria. In this way the proteobiotic molecules produced by probiotics, are a new approach to rebalancing the gut flora. 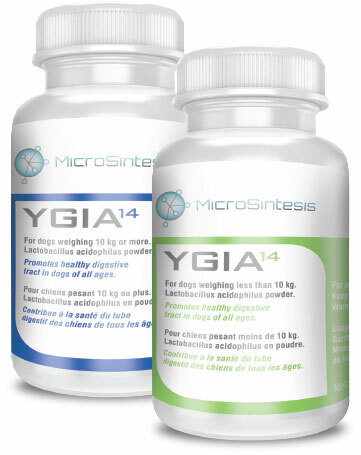 Find out more about rebalancing gut bacteria in canines with Ygia.